Bucharest is one of the biggest capitals of Eastern Europe, from a surface an population point of view, one would have to travel over 1000 km to find a city equally big or bigger than Bucharest. It is a dynamic and prosperous city. In a study of fDi Intelligence, Bucharest together with Ilfov, the region surrounding the city, are classified as one of the most prosperous areas of Eastern Europe. The city is constantly changing, the large multinationals are changing the cityscape, demanding office spaces especially in the north of the city. The center of the city, where some of the universities are, is full of students and an unlimited supply of places of entertainment. Green spaces abound and is one of the assets which this city has. The capital of Romania is also a meeting point of many nationalities and the number of expatriates is considerably higher than in other European capitals. These are just some of the reasons why we are committed to Bucharest. The city center still has an affordable housing market for small investors and is very attractive to large investors, providing an acceptable performance, with growth prospects and at the same time offering quality for the properties and the environment. 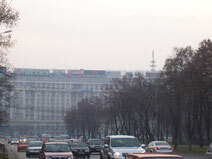 The center of Bucharest is still an affordable place to invest in real estate. The best way to invest would be buying real estate in the most popular areas like downtown or the north, conditioning it and then rent it to targeted clients such as expatriates and students. We know the preferences of each group, we know what they want and we can offer the best deals and services with the highest return for our investors. Our system can ensure a return on investment between 4% and 6% a year while ensuring that the property is not deteriorating and we also ensure quick response to any repair or upgrading situation. We handle everything from the purchase and the corresponding administration, to the conditioning of the house, the relation with the owners’ association and the relation with the tenants: we are in charge of finding them, accommodating them, having the permanent contact with whatever their needs may be in connection with the rent until they leave the establishment. You will receive periodic return on investment, keeping it (as you are the owner) always in good condition and in such a way that you may freely have access to your property without any strings attached. For more information, please write or call. 52.216 m2 (5,22 hectares) of land located in the locality Piscani DN73 (Darmanesti), with 229 meters of the road opening.